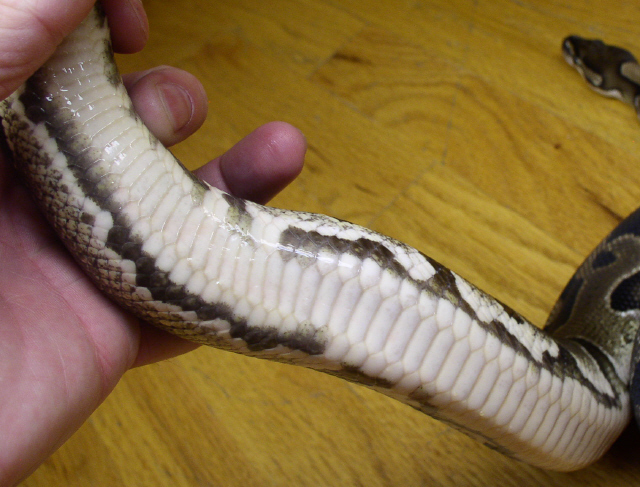 Description: Raul Gomez produced this as a 25% chance het pied male in 2004. 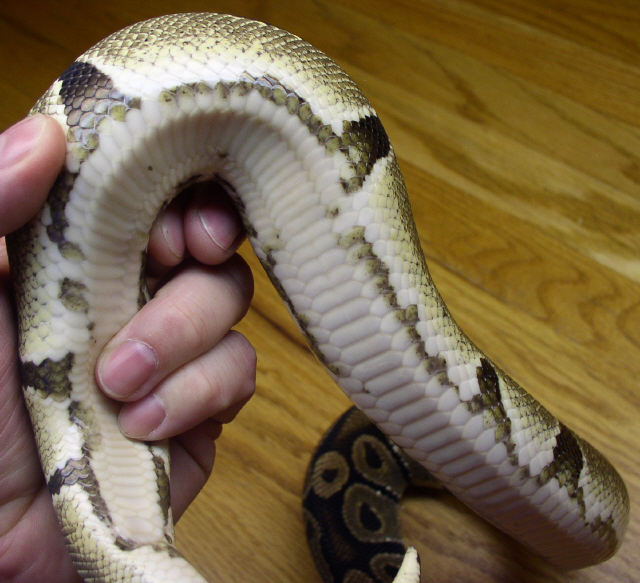 His father was a 50% chance het pied from the Snake Keeper and his mom an interesting wild bred from Ralph Davis. Some of his siblings have since proven (producing at least one very high white pied) so he is now up to 50% chance het pied. 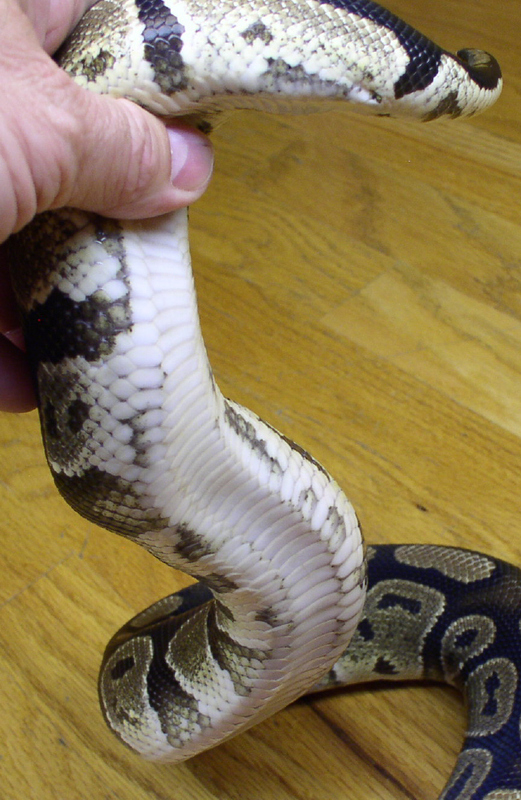 However, judging from his belly stripes I would be very surprised if he isn't het pied. Description: I picked this assumed captive hatched 2004 male at Animal Attraction in Greeley Colorado. He is very bright with lots of fading and a clear belly. Some day I would like to breed him to a fire. I mis-sexed this snake as a female when I found him and tried for 5 years to get him to breeding female weight before realizing from his behavior that he is male. For 2010 I have finally him breeding a long shot possible het albino girl. 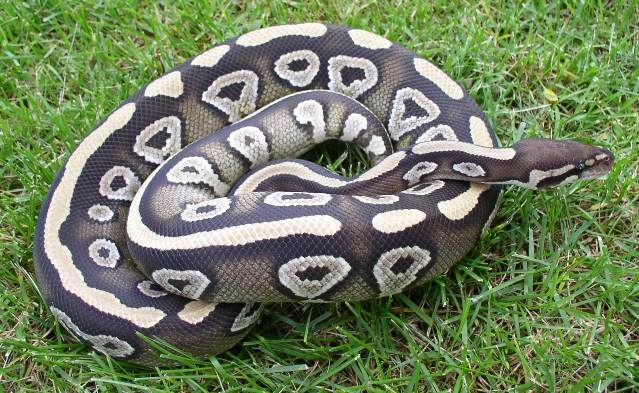 Description: I picked this possible double het for stripe and albino up from Ralph Davis. Both of his parents where double hets so he has a 2/3 chance of being het for each, a 4/9 chance of being het for both, and only a 1/9 chance of being completely normal. I'm very happy with his light color, fading, and regular shaped light circles down the back. I'm looking forward to hopefully getting a clutch out of him and my possible het stripe girl and also some possible het albino girls for 2009. Description: Daniel Garcia hatched this boy from F97BPET on a breeding loan. He and three of his sisters out of a clutch of 8 proved that pet store girl genetic. He was actually sexed female when I got him and I didn't figure out I had a male until combat while trying to breed in Feb 2010. He produced 2 super chocolate babies bred back to the founding female in 2010 so I'm calling these Garcia line chocolates. 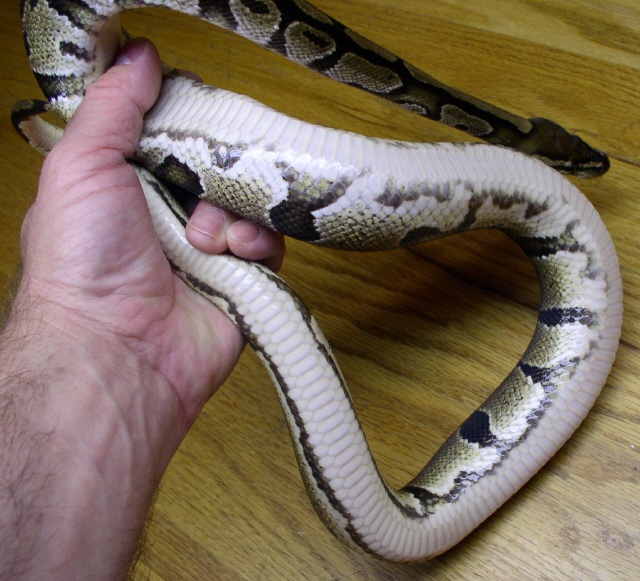 Description: Ralph Davis produced this very nice possible double het albino and pied guy. Both of his parents where double hets so he has a 2/3 chance of being het fro each, a 4/9 chance of being het for both, and only a 1/9 chance of not being het for either. His markers are moderately good so I feel hopeful that he at least hit the piebald gene and look forward to trying to breed him to several possible het piebald females. Another beautiful RDR snake that I'm very happy with. 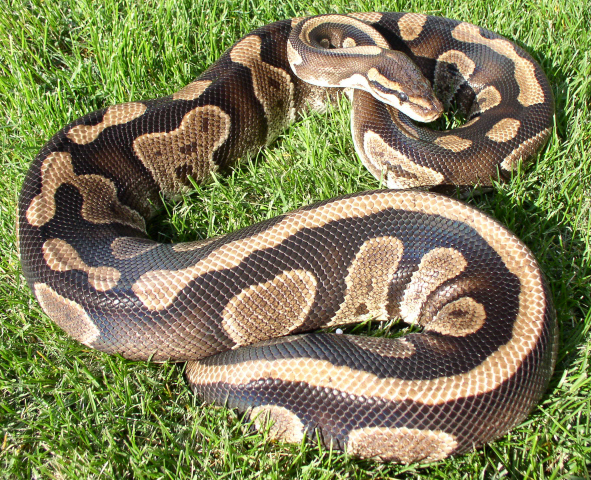 Description: Marshall Van Thorre produced this 2008 male breeding lesser and mojave to my original Garcia female. He has wide alien spacing which is within normal for Mojave but he also has some of the white checking on the lower side that is more extreme in his sister. I feel pretty confident that she is a Mojave Garcia combo. But is this male also the combo? For breeding purposes I really need him to be. 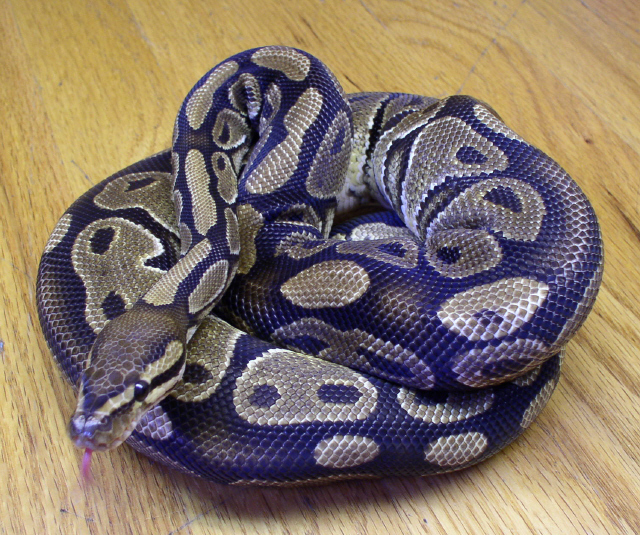 He has one other brother like him but if they are Mojave only then there is only one maybe two Garcia males so far. Description: 1996 normal with lots of yellow and a healthy appetite. I got her from Petra Spiess who got her from Tracy Barker of VPI. She produced a daughter with clown like characteristics bred to a 50% chance het stripe in 2002 so for 2010 I have her on a breeding loan to a male clown. She is also the mother of my female spider from 2007. Description: I picked this girl up as an adult at Reptilian Haven in Denver Colorado in July 2001. I particularly like her wide pattern elements. It sort of reminds me a little of the SnakeKeeper's Mojave. In 2007 she finally produced and half her offspring looked like her. 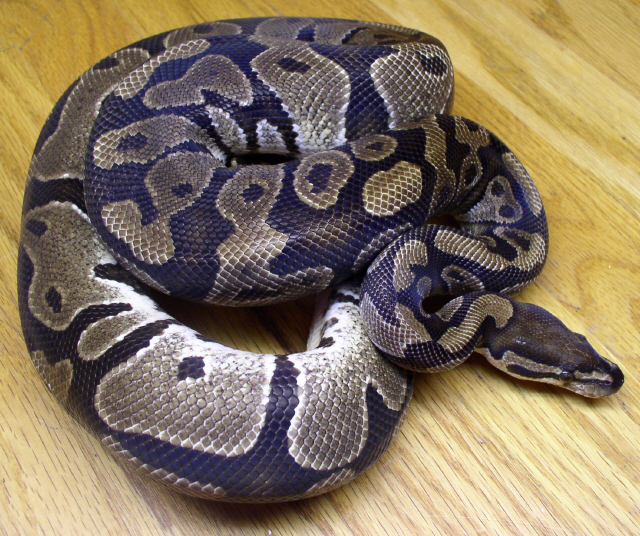 In 2008 she produced 14 eggs bred to a mojave but none of the babies where white. I'm now thinking she is something like chocolate but since I'm not sure if the same or not am calling her morph Garcia. 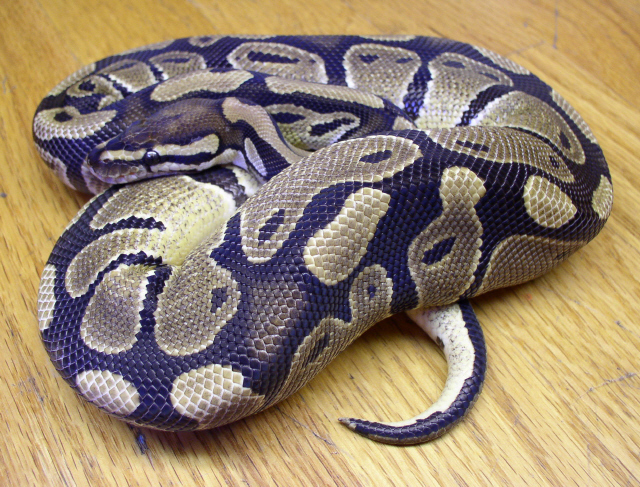 Description: This is one of 4 sisters (they had twin brothers that I didn't keep) that I hatched in my first ball python clutch in 2000. Her mother was my old reliable female and her father was a het for albino that Kevin at NERD donated to an auction I won. Her maternal grandmother was rescued by Mike Rapley after being abandon sick behind a pet store in Fort Collins, Colorado on a cold day. I sold one of the sisters after she proved het albino and two others as a normals after enough babies that I felt it was likely they weren't hets. In 2009 this remaining girl proved het albino by producing a beautiful albino daughter with a possible het albino male. Description: I purchased this imported girl at 688 grams from Allan McHenry in early August 2003. I'm guessing she hatched in 2001 but I suppose she could be older or even a 2002 baby depending on how well she ate in the wild. She has dark eyes and her first sheds after I got her was patternless. In two months she was around 1,200 grams but then she slowed down and has been a sporadic eater ever since. She has also picked up more lemon yellow dorsally and is darkening and her sheds now have pattern. She has yet to reproduce. 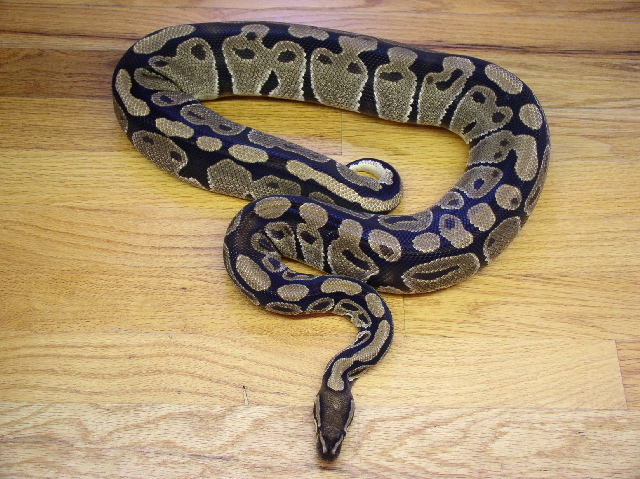 Description: This is one of 2 sisters (other is F01PREMB) still in my collection that I hatched in 2001 from a Peter Kahl 50% chance het pied (M98PPKR) that my sister acquired by way of Ralph Davis. The breeding card notes on the father are that his mother was "normal (N7)" and his father "het Piebald (1EW 2EW)". 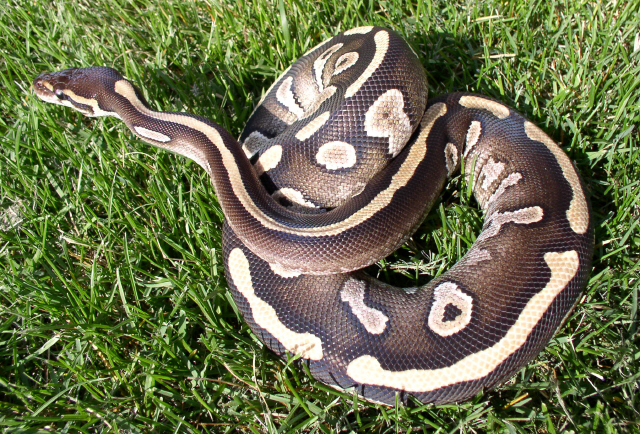 No pieds out of four babies with a well markered possible het pied in 2008. She decided not to produce in 2009 but for 2010 I'm trying with the RDR possible double het albino pied. 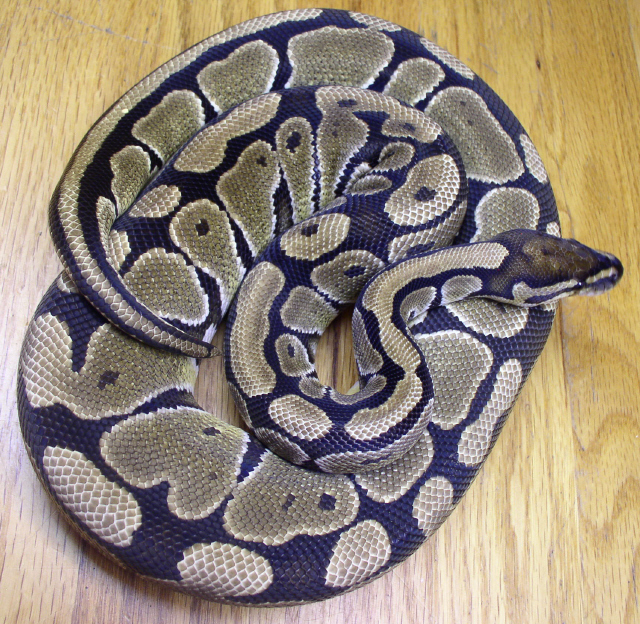 Description: This is one of 2 sisters (other is F01PREMS) still in my collection that I hatched in 2001 from a Peter Kahl 50% chance het pied (M98PPKR) that my sister acquired by way of Ralph Davis. The breeding card notes on the father are that his mother was "normal (N7)" and his father "het Piebald (1EW 2EW)". Like her sister she was out on a breeding loan for some time but now that I have her back am looking forward to testing her for het pied in 2010 with a pairing to the RDR possible double het albino pied. Description: This girl was the loan good egg from the first clutch of F98NVPIL (ch from VPI) and M99PPKRS, a 50% chance het pied produced by Peter Kahl that my sister purchased from Ralph Davis. The father's card lists the paternal grandmother as "Nor 28" and the het piebald paternal grandfather as "1/7, 2/8, 1/10", whatever that means. This girl has never been able to shed without assistance. Randy Plank who looked after her for a while didn't think she has a tongue. She also only seems to like mice or ASF's (although I did try a few rats after starting on ASF's and had some luck finally). 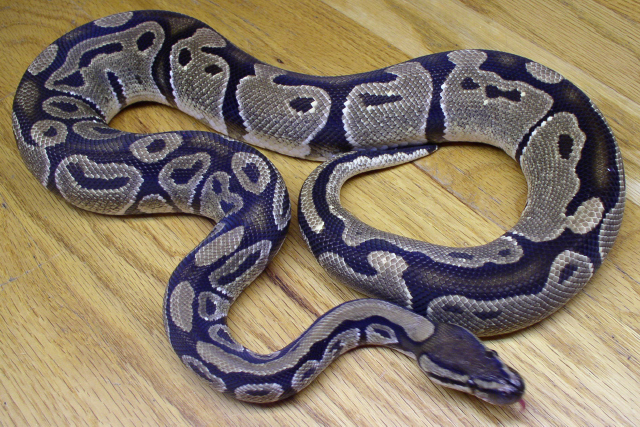 Description: I hatched this girl in 2002 from a 50% het stripe male (M00SVPI) I bought from Tracy Barker. She's nice looking so of course a bad feeder and prefers mice and hasn't been quite big enough to produce yet. I just got her back from several years out on breeding loan in 2008 and now she is feeding batter. I actually think she might be gravid with my RDR het albino 66% chance het stripe male. 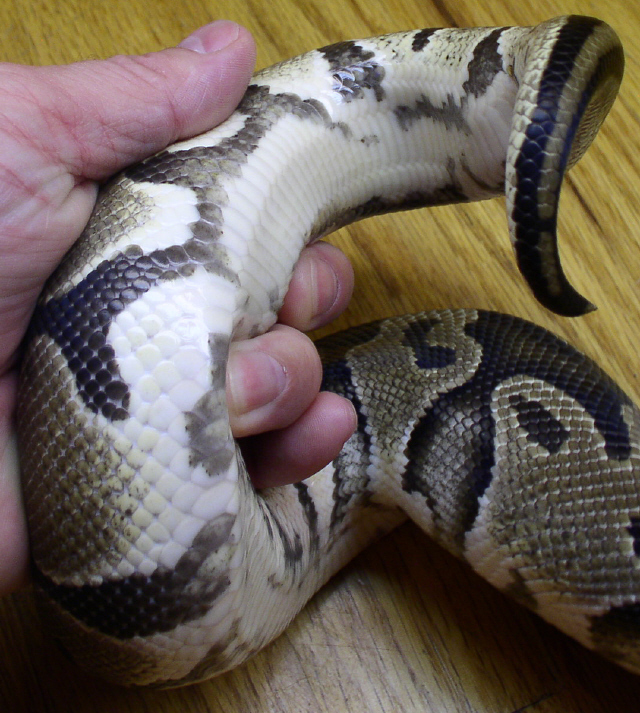 Description: First of three 25% chance het pied sisters I produced and kept in 2003. 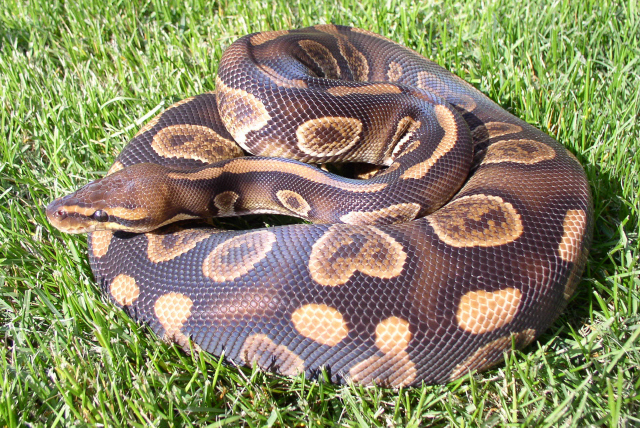 Their mother was a F98NVPIL, a very large 1998 captive hatched purchased from VPI and eventually sold to Mike Wilbanks. 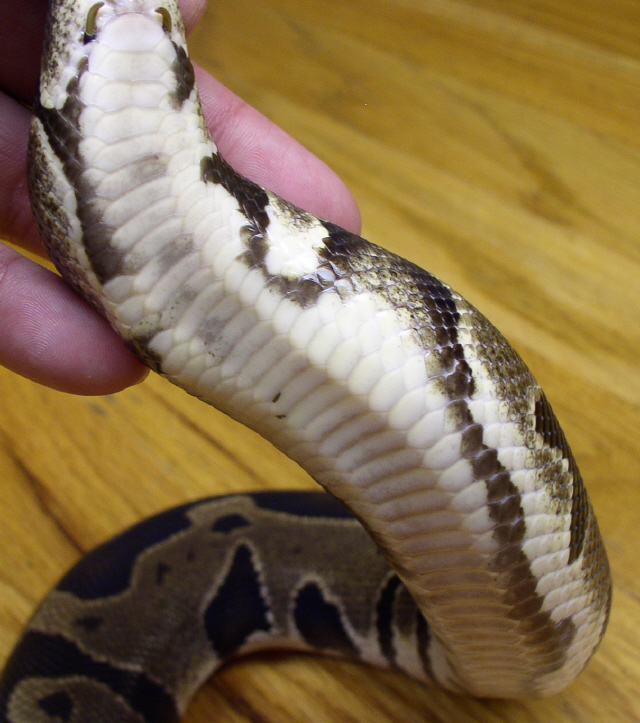 Dad was M99PPKRB, a small but colorful 1999 50% chance het pied produced by Peter Kahl that my sister purchased from Ralph Davis. Not sure how to read his feeding cards but I show mother as "normal (Spot)" and father as "het Piebald (1/9, 1/8, 1/7)". 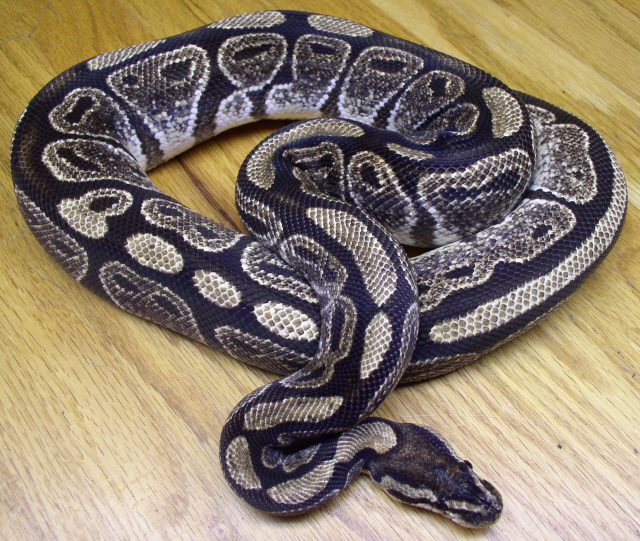 Description: Second of three 25% chance het pied sisters I produced and kept in 2003. 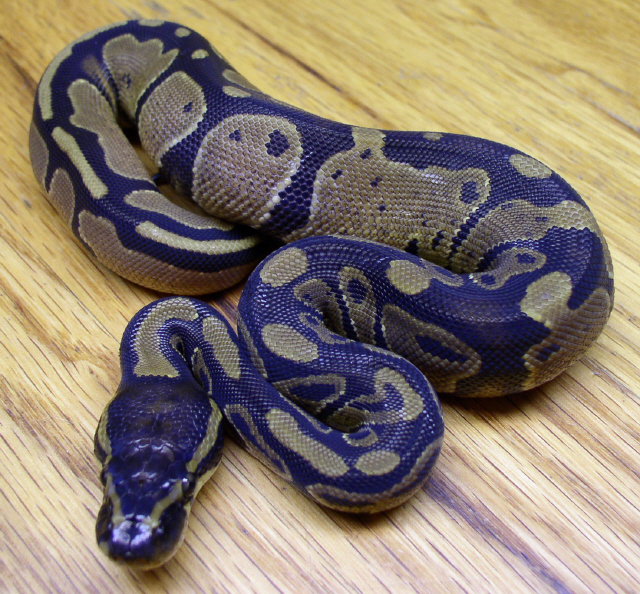 Their mother was a F98NVPIL, a very large 1998 captive hatched purchased from VPI and eventually sold to Mike Wilbanks. 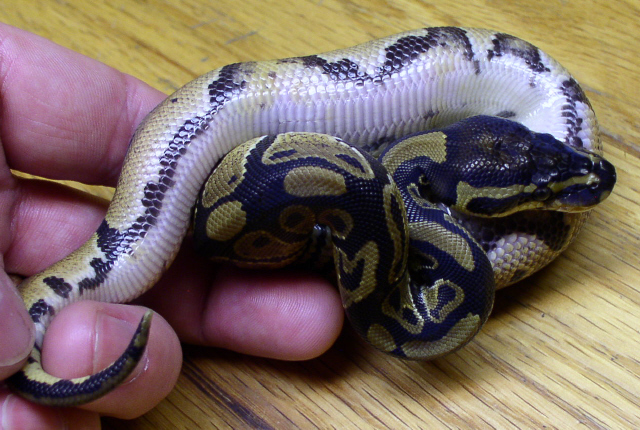 Dad was M99PPKRB, a small but colorful 1999 50% chance het pied produced by Peter Kahl that my sister purchased from Ralph Davis. Not sure how to read his feeding cards but I show mother as "normal (Spot)" and father as "het Piebald (1/9, 1/8, 1/7)". 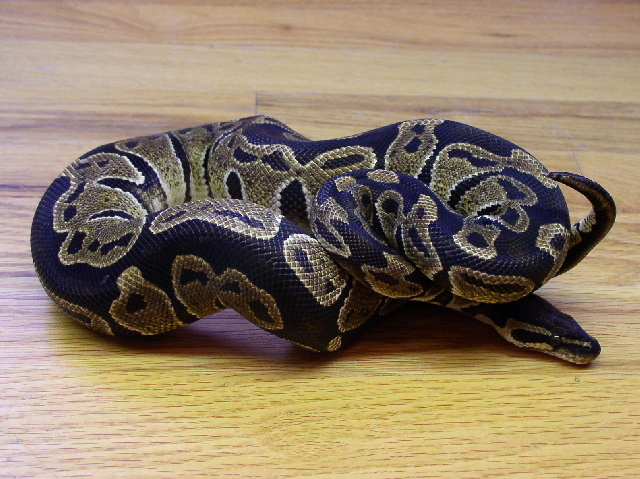 Description: Third of three 25% chance het pied sisters I produced and kept in 2003. 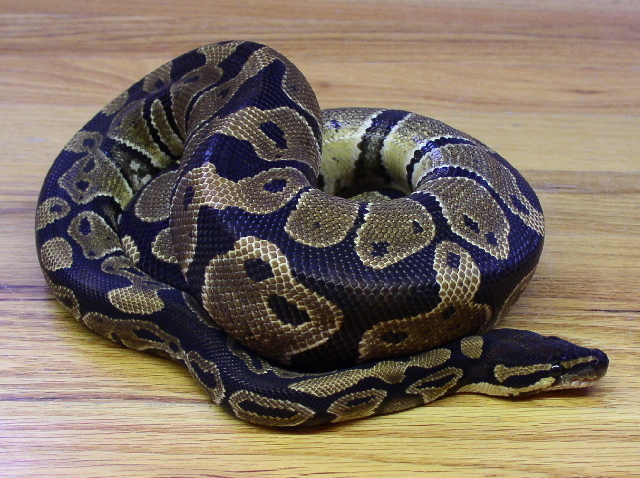 Their mother was a F98NVPIL, a very large 1998 captive hatched purchased from VPI and eventually sold to Mike Wilbanks. 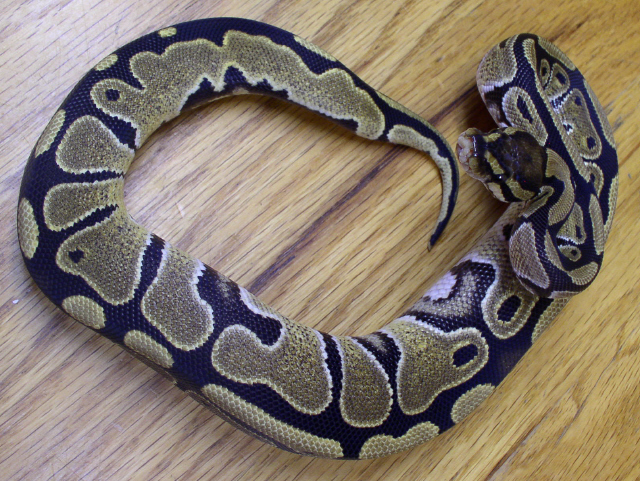 Dad was M99PPKRB, a small but colorful 1999 50% chance het pied produced by Peter Kahl that my sister purchased from Ralph Davis. Not sure how to read his feeding cards but I show mother as "normal (Spot)" and father as "het Piebald (1/9, 1/8, 1/7)". Description: I hatched this 50% chance het albino and 25% chance het Jolliff axanthic in 2003. Her father, who proved het albino in another clutch, was M00AJPN produced in 2000 by Paul Newstead breeding het albino to double het Jolliff snow. Her mother was F00AREM3, a 50% chance het albino I produced from a NERD het albino and F97AMR. I eventually sold her mother as a normal after enough breedings to het albino that I thought she was likely not a het. Description: I hatched this girl as a 50% chance het ghost female. She was much lighter than her sister's who I ended up selling as normals (about half the clutch was brighter but all the other bright ones where males). 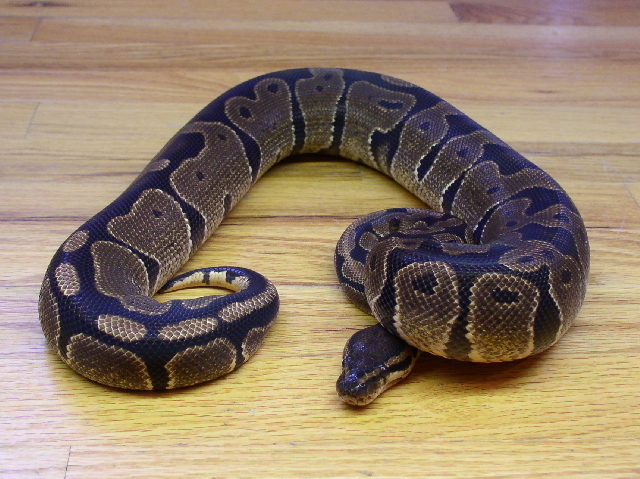 Her het ghost father was M02GAVC purchased from Aaron Van Camp. In 2009 I proved her het ghost by producing a ghost son with a pastel het ghost father. 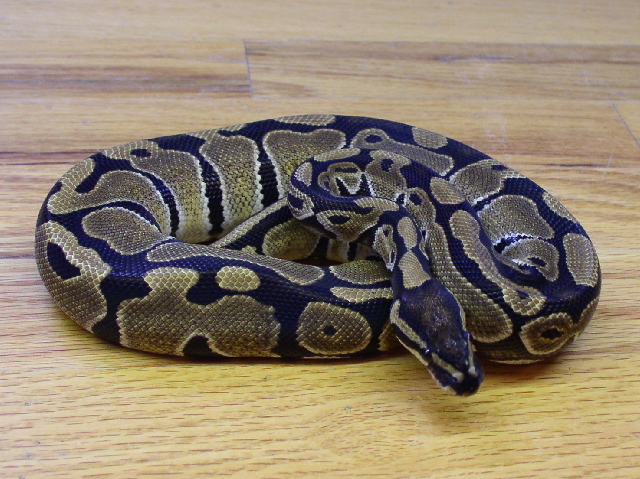 Description: I picked this captive hatched 2004 female at Scales and Tails in Littleton Colorado. I liked her side fading, tendency to have Cyclops aliens, and clear bell. 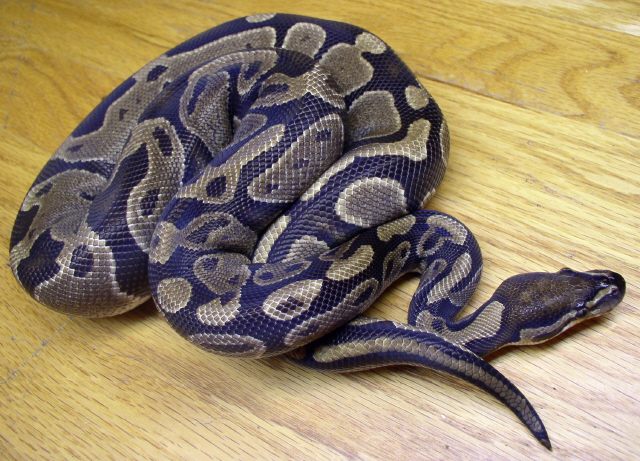 I'm hoping she is something like the phantom/mystic so am testing out that long shot breeding her to my mojave male. Description: Marshall Van Thorre hatched this 2007 female spider with F96NVPI (see above) on a breeding loan. There where 13 eggs in that clutch. Hopefully she'll grow up to be as big and bright yellow as mom. Lately she has gotten quite a ghostly look so not sure what is up with that (her mom is very bright). Not sure what I'll eventually breed her to but she has some more growing to do first. Description: Marshall Van Thorre hatched this 2007 female 100% stripe and I'm thrilled to have her. Now I just need to come up with a het stripe male for her and my adult 25% chance het stripe female. Both are nice bright colored girls. This little one is a little on the defensive side still. 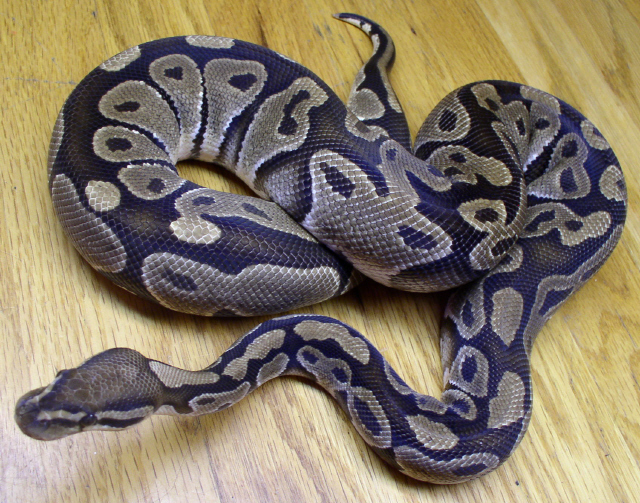 Description: Marshall Van Thorre hatched this 2008 female by breeding a lesser and a mojave to my original Garcia female. 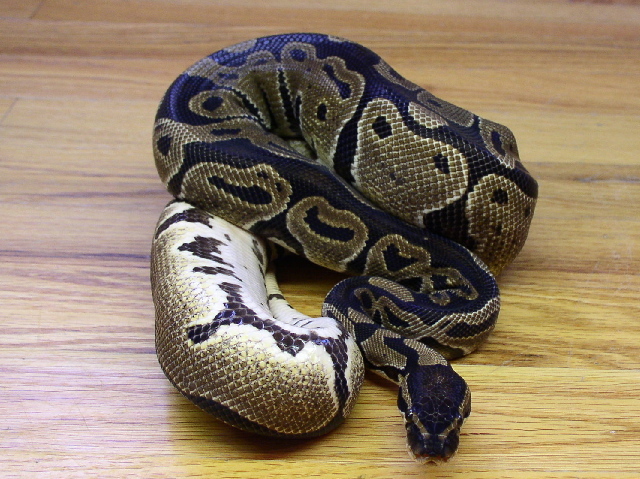 I believe she is a Mojave Garcia combo based on the checkered white on her lower sides and rich chocolate coloring. There was another sister like this and two brothers with much less checking and two other brothers that seemed to be normal mojave's and another brother that is just Garcia and two normal brothers. Description: This daughter of M04PRG01 and F01PREMS came out with a het pied belly that was too good for me not to keep. She also has this ghostly look that her father has. I need to remember to ask Raul if he has ever breed two of those together.